Like most of Missouri’s gilled pond snails (prosobranchs), these live in a clear, rocky Ozark stream. Most people know a snail when they see one, but it is less common to be able to tell the difference between the two main types of aquatic snails. Prosobranch snails have a long incurrent siphon (tube) that draws water into the mantle (the tissue connecting the body to the shell), where gills extract oxygen. Thus they are able to “breathe” underwater much like a clam. Another key characteristic of prosobranch snails is the operculum, a hard, horny, rounded “trapdoor” attached to the foot that seals the opening when the animal retracts into the shell. It functions to protect the snail from predators as well as to keep it from drying out if it should be stranded out of water for a time. Shell length: ranges from 1/16 to 1 3/4 inches; most are around 1/2 to 3/4 inch (varies with species). The sharp hornsnail, a gilled aquatic snail, is fairly common in Ozark streams. As this prosobranch pond snail crawls on a rock, you can see its foot, snout, tentacles, and one of its eyes. As this prosobranch pond snail crawls on the side of an aquarium, you can see its foot and its mouth opening. Various species are found in all types of aquatic habitats, though in Missouri, the only region where gilled aquatic snails dominate is the Ozarks, where the many well-oxygenated, flowing streams and spring branches support these types of snails. Several Missouri gilled snails are cave species. As with other aquatic organisms, such as darters and minnows, the many separate, small streams of this region often support different species due to geographic isolation. Most freshwater snails graze on plant material or (sometimes) scavenge on dead animals. It is common to see pond snails gliding about on submerged rocks; each one is scraping algae from the surface using a minute mouthpart called a radula, often described as a “rasping tongue.” If you collect pond water in a jar and place pond snails into it, you will soon be able to see these mouthparts as the snails attempt to forage on the glass. Because many of our prosobranch species are limited to individual, separated watercourses, they tend to be less widespread and are more vulnerable to localized environmental disruptions. Nearly a dozen (or almost a half) of Missouri’s gilled snails are Species of Conservation Concern and are vulnerable to extirpation from our state. Four of these are cave snails. 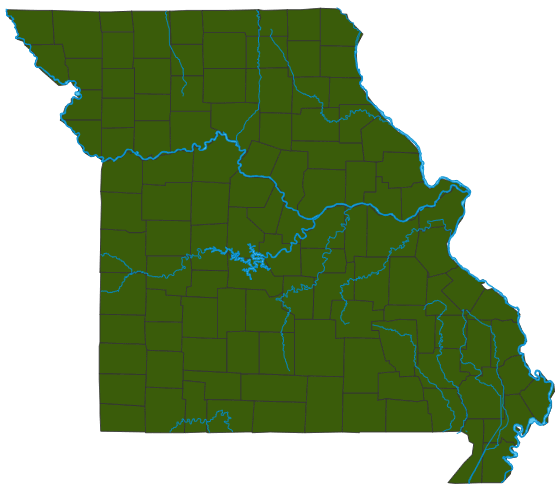 One species, the Tumbling Creek cavesnail (Antrobia culveri), is listed as in danger of extinction in Missouri and federally. Most prosobranch snails have separate sexes; an individual is either male or female. Fertilization is usually internal, and freshwater prosobranchs typically lay eggs in clusters within gelatinous cocoons. The shells of snails (especially those of some of the spectacular and colorful marine species) are prized by collectors and made into jewelry and other decorative objects. In old-time Ozark dialect, water snails were commonly called "pinnywinkles," which is one of many examples of antique forms of English that survived from early colonial days in the then-culturally isolated Ozark hills. It is basically the same as the Old English word "pinewinkle." Aquatic snails play an intermediate role in aquatic food chains, eating plants and then becoming food for larger animals. Several types of fishes have specialized throat teeth for cracking snail shells. Some birds and other animals eat snails, too. Gyraulus, Helisoma, Menetus, Micromenetus, Planorbula spp.